Graham Vaughan Sloper AM, Commodore RANR (Rtd.) 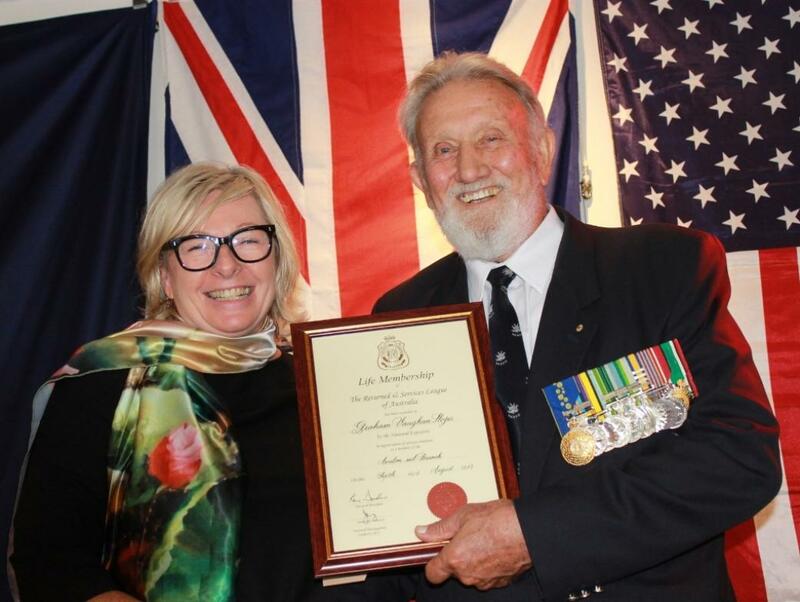 President Avalon Beach RSL Sub Branch passed away on Sunday December 4th. A Service celebrating his life was held at Maria Regina Catholic Church, Avalon and afterwards a Wake was held in the Avalon Beach RSL Club, where he served as President for many years and initiated and carried forward the Avalon Tattoo for 10 years. An inspiration to many, his ceaseless efforts to look after all who had served, were echoed by his daughter Tamara Sloper Harding when, among other ‘tall tales’ being told in fond remembrance, communicated one work he wanted carried forward and taken up by all sub-Branch members everywhere. In this one minute appeal Tamara reminded the community that this was a man who cared about everyone, who gave all his time and energy to develop ideas to fill gaps where they were or create events to bring together people so they could understand each other where understanding was missing. He always had time for everyone, and you could tell he’d been this way since he was knee high – it just came naturally. But as he said when awarded the 2015 Pittwater Community Service award, “I’m not in it for the kudos..” – he was about the results, about giving something worth receiving, something needed. Someone once said that you’re lucky if just one someone understands what you’re getting at, saying or trying to give, that if you get through to just a few you have done well. In Graham’s case he got through to, and gave to, thousands, for decades. That will not be dispersed. Graham built things here that were not made from concrete and steel – was integral in the setting up of the Northern Beaches Veterans Centre which looks after all Veterans and their loved ones and worked and worked to honour the ANZAC Centenary with a huge Memorial Service to create a lasting memory for the thousands that attended the March and Commemoration. These will not be dispersed. Graham has one great son, two wonderful daughters and six grandchildren all imbued with caring about others as well. That too will go forward, that too will not be dispersed. A book would be required to catalogue all spoken of him and all he has done. Fortunately when he was awarded Life Membership of the Returned Services League he spoke a little about the long road behind him and former Mayor of Pittwater, Councillor Jacqueline Townsend provided a chronological sequence of the office and positions he held. That page is available here. A Profile here. His taking the opportunity the Community Service award afforded to remind us all to ‘look after the new Vets coming through’ here. At Commodore Sloper’s Celebration of Life and Service at Maria Regina Church, his son Morgan shared a few laughs about the father who could through a medicine ball at a father-son weekend other dads struggled to lift, or that he never raised his voice, even when Morgan totalled the car, amid reiterating that his grandchildren and children were his most prized, and what he was most proud of. I sat down with a glass of red last night to mull over what to say today. It is difficult to know where to begin – or where to end when talking about my Dad, Graham Sloper. He was an incredible role model to us. Yet, nothing I can say here will do him justice or suffice to portray the larger than life man he was. He meant such varied things to so many people. He was involved in numerous aspects of defence force and community life. He led an unbelievable life of adventure with vigour and courage. To some he was an officer, to others a rugby, hockey or water polo team member. In Avalon he was the Ute driving Military Tattoo Organiser from the RSL Sub Branch. He was the guy that ran the Dawn Service for decades. Here in the Parish he assisted with the children’s liturgy downstairs during Mass – or was that a secret ploy to escape Father George’s homilies! The poor bloke even got called “the hat lady’s father” on occasion. He fulfilled such a variety of roles in our lives and took his passion for people and community way beyond his service in the military. To us, his family, he was husband, father, grandfather and brother. To my mother Dannie, he was the love of her life. The story of their romance captivated us as children. (It will make an interesting tale for the RSL later.) He was a fun yet extremely organised Dad – family trips were planned with precision – often involving a 0500 departure for the Navy cabins at Burrill Lake. Dad was used to being in command, but I wouldn’t go as far to say he was a control freak. However, some of his more interesting personality traits and organisational abilities have been inherited by the next generations of our family – not that I am referring to anyone in particular. When ashore he was fond of cooking. He even mastered vegetarian cuisine for my sister Martine. Before deployments he would stock our chest freezer with a side of beef (not for Martine) – look at Mum and say “Well that should keep you all going while I am gone”. For all of us kids he created a life of adventure – whether it was the home brew exploding under the house in the middle of the night or the yabbies we’d caught in the river chasing us around the backyard, one still firmly attached to the Labrador’s nose. He would swing us around on the hills hoist. He taught us to fish. He created abundant vegetable gardens that we kids loved to harvest. Then he would go to sea for 9 months leaving the daily watering of the tomatoes to Mum. Martine and I didn’t mind – her evening foray in the garden gave us plenty of time to make Morgan eat all our peas! His grandchildren gave him a new lease of life. He inspired in them the same love of books and hunger for knowledge that he did in us. He has passed on his skills in all things “handy man” – the bigger the project the better. We learnt never to mention pruning a tree around Dad – for before you could blink he would’ve taken to it with a chainsaw. For months my kids as toddlers re-enacted the “Papa with a chainsaw” game. Dad, Papa, Graham, the Boss, Sir - whoever he was to us - does not wish sadness upon us today – we should celebrate his amazing life. He was always up for a party! Some of my happiest childhood memories were formed whilst eaves dropping on future senior officers at cocktail parties or bbqs at our place! Dad’s party spirit remains here within us - as does his thirst for justice, his community spirit and desire to make a difference in the world. So please. Don’t look at this Mass today as a goodbye – it is merely a bon voyage to Graham as he sails for his next adventure, a celebration of the incredible life and the legacy he leaves behind. He didn’t leave us a side of beef this time, just a shopping list for the Sub Branch trip to the Fishmarkets to buy Christmas lunch. We will miss you Dad but hope to join you one day – after we have completed the many lists of jobs you have left for us. In the meantime Dad, keep the drinks cold and the cheese platter stocked. We love you more than words can ever convey. Good afternoon Ladies and Gentlemen, my name is Tamara Sloper Harding and I represent the RSL of Australia and in particular Avalon RSL Sub Branch. On behalf of the Sub Branch I want to express to the family and friends our deepest sympathy with the passing of Graham, I feel truly honoured to be given this moment to acknowledge Graham’s ties to the Defence Force. It’s these ties, this sense of comradeship that bind all servicemen together, wherever or whenever we served. We have a unique relationship, a particular understanding of what it takes to draw on all our inner resources and find strength and courage when under threat. Graham had a long and renowned career. He served Australia with great distinction. He lived the ADF’s inherent values of courage, initiative and teamwork with gusto. Forthright and courageous, he was cheerful, focussed on winning and getting the job done. His infectious attitude was the key to his leadership style. He was the epitome of the old Navy catchcry of “work hard play hard”. Graham relished a challenge, especially where physical strength is demanded. He had the virtue of physical courage that not many have the opportunity to display. He was careless of pain. Representing the Navy in sport was a huge part of his life. He was a people person – always putting the needs of his troops before his own. He was described as the last of the colourful characters that made up his generation of Naval officers. He has always been larger than life. When I was a junior officer I looked up to Graham and it was his strong moral courage that I found most inspiring. He shaped many of our careers and influenced so many of our lives. The overwhelming message coming through from his former shipmates is that “they would follow him anywhere”. He was a leader like no other. Graham is still with us, his legacy lives on in all of us, especially here, in this community, and we must continue his work for the benefit of others. Unfortunately my time is limited, for I could entertain you for hours with tales of Graham’s time in the Navy! To hear those you’ll need to join us at the Avalon RSL for a drink in his honour or join the Facebook group where many shipmates are adding stories and photos. The hour has come for rest. This poppy is an emblem of sacrifice, signifying the symbol of life given in the service of one’s country. It is a link between our comrade and those of us who remain. I place these poppies on Dad’s Coffin in remembrance. Countless messages of condolence and expressions of sympathy have been sent to the family of Graham Sloper. Just as many have expressed thanks for something he gave, did or supported. Others have shared fond memories, anecdotes that make you laugh. It seems that this is and has always been the mark of a great man, that which is of a light that cannot be dimmed or put out. That too shall not be dispersed.